Abundant Prosperity – Wisdom and Focus is Your 2 Ticket Winning Combination for Success! 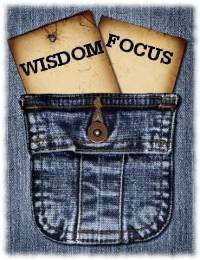 The Power of Increased Wisdom and Focus for Growing Prosperity! overwhelmed, troubled, and not prospering in at this time? and find out how it can turn that troubled area into success? Obviously, when it comes to dealing successfully with the trials and storms of life that blow through, the wisdom of God is a very powerful commodity. The book of Proverbs shows us over and over that wisdom brings the knowledge of what to do in situations, and it results in a prosperous, successful, and long life. When trouble comes, we usually encounter a lack of wisdom. And this tends to be on top of an unstable mind, which is of course also lacking the single minded focus needed to prosper. A double minded person is moved in whichever direction the winds of adversity blow. So how do we get the wisdom needed to attract abundant prosperity and success? By asking God in faith; and confidently trusting Him to give the wisdom He said He would give when we ask. This should come as no surprise, since everything in the believer’s life comes back to faith. How do we ask in faith? It is not difficult! Simply ask God according to His Word. Now we move forward in confidence, knowing and acting as if we have received. We stay mentally fixed, focused, and immovable that God’s Word will come to pass and manifest in our lives. That is asking in faith. On the other hand, if someone asks timidly and full of doubt, they are like a wave being moved in whichever way the wind blows and never receiving anything. The wavering believer says, “I am healed. No, I think I’m sick. Yes, I’m healed. Wait, I think I feel sick.” The double minded believer is not going to receive anything. Bottom line: Wisdom is required to live an abundant, prosperous life. And God is just waiting to provide that wisdom to those who ask Him for it by faith. Overcome unbelief and doubt by keeping a fixed, single minded focus on the request made in faith according to the Word of God. Let wisdom and focus be your winning combination for success and abundant prosperity. May your increased wisdom and focus be followed by the abundance of God and a life of growing prosperity! P.S. I’d love to hear your comments and image thanks to Billy Alexander!